5. twelve days. Well, I guess I had better quit, or you will get tired of reading this thing. My A.P.O. is now 230. The rest of the address is the same. Thanks again for sending me the Scuttlebutt and hope I can continue receiving it. Wishing the best of luck A. J. Musil P.S. Here is my address. Pvt. 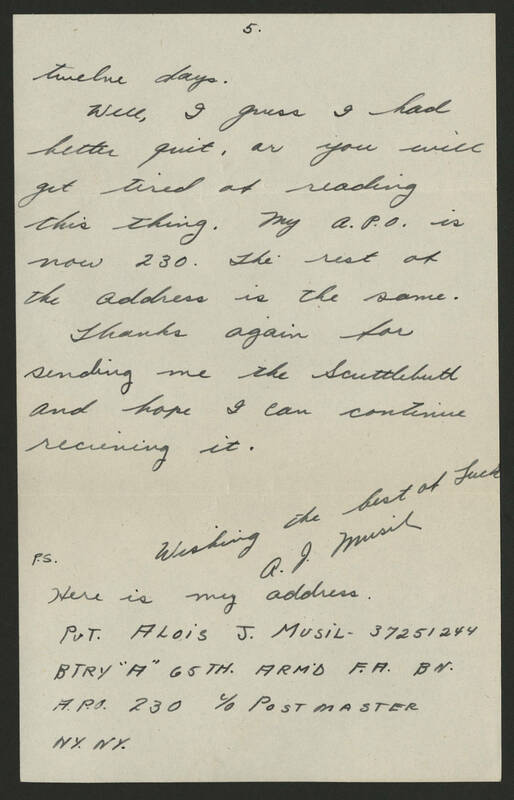 Alois J. Musil - 37251244 BTRY "A" 65th. ARM'D F.A. BN. A. P. O 230 [c/o?] Post Master NY.NY.